The coat of arms represents: three volcanoes (one for each of the three mountain ranges in the country) and an extensive valley between two oceans (Pacific Ocean and Caribbean Sea) with a merchant ship in each one (representing the maritime history of the country). In the horizon a rising sun. All are surrounded by a golden frame with golden beads (coffee). Two palms close the arms joined by a white ribbon with the motto "República de Costa Rica" in gold. An arch of seven stars represent the provinces of the republic. 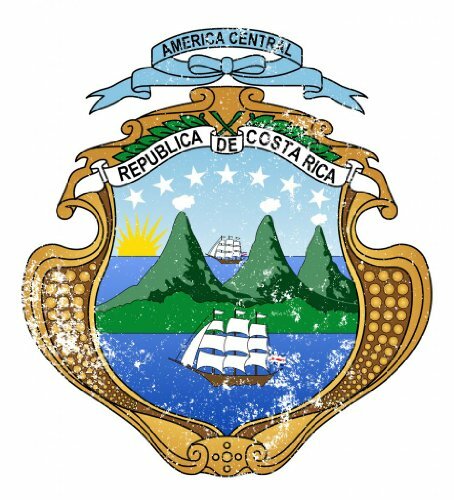 The arms are crowned by a blue ribbon with the motto "America Central" Show off your Costa Rican style with this sweet vintage print. Printed on a 6.1oz. 100% preshrunk cotton tee. The inks used are a water based eco-friendly ink developed by Brother to hold up well under normal washing and drying. It is similar to water based screen printing inks that they give a really soft hand feel and wash well. If you have any questions about this product by FourEleven, contact us by completing and submitting the form below. If you are looking for a specif part number, please include it with your message.